Seven-year-old Samuel was once a Ugandan refugee. Now, he’s found his way into a Kinship Project, under the loving care and protection of the home parents. But the trauma that Samuel suffered before he came to the Kinship still haunts him. After his arrival at the home, Samuel has become non-verbal, has lost his bladder control, and cannot hold down food. Samuel suffers from PTSD. And of course he does. Samuel has seen and experienced things that no one, especially not a child, should ever have to endure. Something that can help a child like Samuel is to introduce him and children like him to the healing powers of music. In addition to recent research on the therapeutic effects of music therapy, Kinship Projects have also seen their own successes in regards to the healing power of music. Because of this, we're seeking to develop Kinship Live, a program that will help provide music as therapy for children like Samuel. Children enter into music lessons because it is a fun activity, but it has the potential to be something much more far reaching than simple recreation. Humanity has known about the therapeutic effects of music for centuries. Even the Bible highlights it, with stories like David playing the harp to soothe the soul of King Saul, as well as the presence of many Psalms of lament within the scriptures. More recently, music therapy has been used successfully with both war veterans and abuse victims with PTSD (Smith and Nobel 1). Because people often turn naturally to music and other creative arts to express a wide range of emotions, music as therapy can serve as sort of back door into therapy for the children in Kinship Projects. Children enter into music lessons because it is a fun activity. But it has the potential to be something much more far reaching than simple recreation. This exposure to music can be life-changing. In situations where words fail them, music can help them speak. Your support will allow children who can’t even speak to express themselves by playing musical instruments and worshiping through singing songs. When a child like Samuel experiences trauma, it changes their brain chemistry (Foran 4). It hurts the way that the hemispheres of the brain interact with each other, which damages thinking and emotional processing in a child’s brain. One of the things that music therapy seeks to do is to “rewire the brain” (Foran 4). But music also has been shown to have an effect on a person’s brain chemistry. And that exposure to music can help undo some of the damage that trauma has on children’s brains. Music is processed in both hemispheres of the brain. This encourages the transfer of information from one hemisphere to the other, undoing some of the damage that trauma has done (Foran 5). Recent research also suggests that music and emotions are processed in the same neural networks of the brain, stimulating emotional responses in the children to music (Moore and Hanson-Abromeit). This can begin healing the damage that trauma has caused so many of these children. Because of its ability to change brain chemistry, music helps children learn to regulate and process their emotions in healthy ways. Learning to emotionally regulate as a child is an important factor in future success in their adult lives. Those who never learn to self regulate are at a higher risk for mental health diagnoses when they are older, while those who learn how to healthily regulate their emotions do better socially and emotionally as adults (Moore and Hanson-Abromeit). Making music with other people can transform a shy, scared child into an engaged, laughing participant. Unfortunately, emotional regulation is something most of these traumatized children have never learned to do. Music is one way for them to learn how. One of the benefits of music as therapy is that it stirs up emotions in the moment, allowing children to experience difficult emotions in a safe space (Moore and Hanson-Abromeit). In this space, they can relearn how to interact with the feelings associated with hard memories. According to one article, music creates a starting point for children to start processing difficult experiences or emotions (Smyth and Nobel 2). Music brings them back to the feelings associated with a stressful memory, and the therapist can help guide them through those emotions from there. Children are able to reprocess those emotions and practice healthy ways to deal with them. Introducing music into the lives of these children is a way to help restore their childhoods. Music is a normal and healthy part of the relationship between most caregivers and children. It’s even believed that the way mothers speak to their young children, and the way the children speak back, can be musical (Barnes). Music serves as a pathway to bonding between a caregiver and a child (Moore and Hanson-Abromeit). This bonding effect of music has the ability to stretch beyond that of mother and child, and can bond groups of people together. It creates space for people to gather together with a shared goal. And the effects of that are powerful. It builds community. Making music with other people can transform a shy, scared child into an engaged, laughing participant. 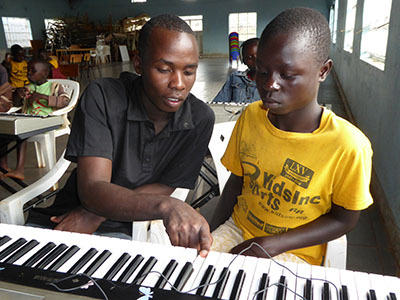 For a child like Samuel, music has the ability to turn his life around. The trauma that he's suffered is unthinkable, and has a drastic effect on his life today. Music can give him the power to face those memories and allows space for him to heal from some of the damage that those experiences have caused. Kinship Alive would give him this access to music, and through that, access to healing. Through the healing that music can provide, Samuel will be better able to process what has happened to him, and help him build bonds with the caregivers and children in his Kinship. Music can help restore Samuel’s childhood. Barrett, Margaret S. "Inventing Songs, Inventing Worlds: The ‘genesis’ of Creative Thought and Activity in Young Children’s Lives." International Journal of Early Years Education 14.3 (2006): 201-20. Web. Foran, Lucille M. "Listening to Music: Helping Children Regulate Their Emotions and Improve Learning in the Classroom." Educational Horizons (2009): 51-58. Web. Smith, Joshua, PhD, and Jeremy Nobel, MD. "Creative, Artistic, and Expressive Therapies for PTSD." (n.d.): n. pag. Foundation for Arts & Healing. Web. <http://www.marketingnavigators.com/FAH2/wp-content/uploads/2015/12/PTSD-White_Paper_Smyth_Nobel.pdf>.